Japan Airlines (JAL) has today launched the JAL New Sky Project to revamp its inflight products and services on international routes. The carrier announced plans to revamp its in-flight product last month (see online news August 16), and has now released more details and images. 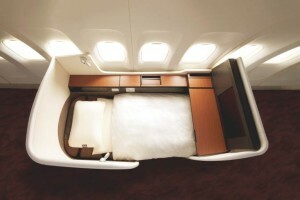 JAL will introduce a new seat design in all cabin classes on 13 of its B777-300ER aircraft. This will start with the Narita to LHR route in 2013 and then progressively be expanded to other European and North American routes. 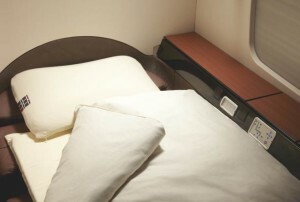 For first class, the airline said the new seat, called JAL Suite, would offer “one of the largest first class spaces available in the skies” with a bed length of 78.5 inches/199cm and width of 33 inches/83cm. The personal TV screens will be 20 per cent larger at 23 inches/58cm, and the seat will have specially designed orthapeidic bedding. Business class seats, called JAL Sky Suite, will also feature these larger TVs, which are 50 per cent larger than those in the current business class. They will have a bed length of 74 inches/187cm, with a maximum width of 25.5 inches/65cm and width at the base of 21 inches/53cm. 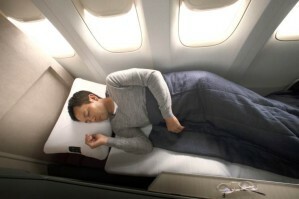 They will offer innovative sleep gear from Weava Japan which uses a finely woven fiber resin to provide maximum comfort. 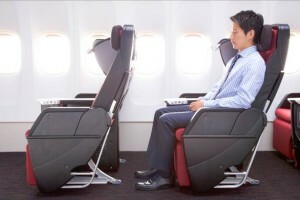 New premium economy seats, called JAL Sky Premium, will increase seat pitch by as much as 4 inches/10cm to 42 inches/106cm. They will have 2.8 inch/7cm greater seat-slide than before and be 19 inches/48cm wide from armrest to armrest. Each seat will have a 35 per cent larger personal television. The seats will keep the same fixed seat back as the existing design, intended to prevent disturbance when the person in front reclines. The new economy seats will have a seat pitch of 34 inches/86cm, which is a 3-inch/7.6-cm increase on the older design. They will have specially slimmed seat backs which provide around 1.2 inches/7cm extra space at knee level. 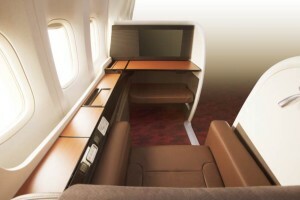 As well as the new seats, JAL will also be upgrading other cabin amenities. They will fit TOTO washlets – electric toilet seats with a water spray feature – in the first and business class cabin bathrooms. The airline is also introducing new inflight menus. For its first and business classes, it has invited four famous Japanese chefs to design special menus, with three-star Michelin chef Seiji Yamamoto, two-star Michelin chef Koji Shimomura, Chikara Yamada and Fumiko Kono. For premium economy and economy classes, the airline will offer seasonal Japanese specialties and meals produced in collaboration with famous Japanese restaurants (see story here).